On 20 May, fusion researchers worldwide directed their attention to Greifswald. What exactly happened on that day? That day marked the transition from pure construction work on our fusion experiment Wendelstein 7-X to preparing it for commissioning. Together with representatives from the institutions and companies involved in the project and numerous former colleagues, we wanted to pause for a moment. Now we start commissioning the machine step by step. 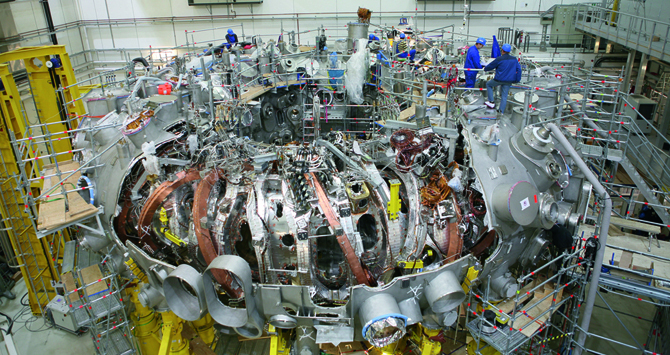 Wendelstein 7-X is a highly complex installation. We test various functions and parameters of the system and prepare it for operation. All this takes place according to a detailed plan. First, we pump out the large vacuum vessel containing the magnetic coils and the plasma vessel. The 70 coils which generate the magnetic field that will contain the plasma during operation are superconducting. At very low temperature levels, they carry electricity without electrical resistance. This means we have to cool them down to minus 270 °C. This cooling of the magnetic coils is the next step. We then start to electrically charge the coils one by one to create the magnetic field. This is roughly the roadmap that will keep us busy for about a year. What is the difference between Wendelstein 7-X and other fusion research facilities? The art of nuclear fusion is to create a magnetic field that will contain plasma with temperatures of up to one million degrees centigrade. The plasma must be as stable and confined as possible. To achieve this, a twisted magnetic field is required. This can be formed in a toroidal installation by sending strong electricity through the plasma, which in turn creates a magnetic field that combines with the externally created magnetic field in such a way as to achieve a twisted field. That is the tokamak principle. Another method is that of the stellarator. Here, the coils are constructed such as to create a twisted magnetic field on their own. So Wendelstein 7-X is a stellarator. What are the advantages of the stellarator principle compared to the tokamak? The tokamak needs strong electricity in the plasma. This cannot be maintained indefinitely. So a stellarator is better suited for permanent operation. Moreover, the electricity makes the plasma more unstable. A number of research facilities worldwide already work on the basis of the stellarator principle. What makes Wendelstein 7-X so special? With Wendelstein 7-X we hope to create a magnetic field that generates a plasma that is similarly dense and hot as is the plasma in tokamak installations. Previously existing stellarators were unable to do so. So in a way, Wendelstein 7-X is the worldwide most advanced stellarator ever. And we are convinced that it is the one that has what it takes to be a power plant. Yet conviction and computer simulations are not enough in the world of science. We now have to demonstrate whether the principle works on a larger scale. How did Wendelstein 7-X get its name? Wendelstein is one of the Munich backyard mountains in the Alps. The IPP has its main offices in Garching near Munich. That was where all the previous Wendelsteins were located. Hence the local connection. The naming of stellarators after mountains is a tradition of sorts. The first stellarators were located in Princeton, developed by astrophysicist Lyman Spitzer. They were developed as part of the so-called "Project Matterhorn". This is how the mountains came to the stellarators. Thomas Klinger is the scientific head of the "Wendelstein 7-X" experiment. The 49-year old scientist studied physics at the University of Kiel. After research periods in France and Sweden he habilitated in 1998 with a paper on "Control of plasma instabilities". He was subsequently appointed Professor for Experimental Physics at Ernst-Moritz-Arndt University of Greifswald. Since April 2001, he has been a Scientific Fellow at the Max-Planck-Institut für Plasmaphysik, Branch Institute Greifswald, and Head of the Stellarator Dynamics and Transport Division. In April 2002, he was appointed Chair of Experimental Plasma Physics at the Ernst-Moritz-Arndt University of Greifswald. He has been a member of the IPP Board of Directors since 2005.